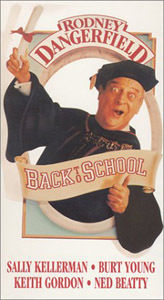 Back to School remains one of the comedy classics to have come from the '80s, and remains the late Rodney Dangerfield's signature cinematic work. You may need someone to help you straighten out your Longfellow, but how well do you know Back to School? Cast: Rodney Dangerfield, Sally Kellerman, Burt Young, Keith Gordon, Terry Farrell, Robert Downey Jr.